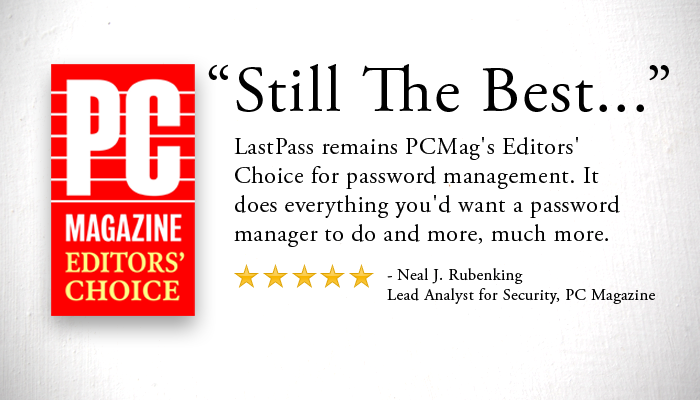 The LastPass Blog: PC Mag Says LastPass Is "Still the Best"! PC Mag Says LastPass Is "Still the Best"! Neil Rubenking, Lead Analyst for Security at PCMag, recently published an in-depth review of LastPass and selected us as PC Mag's Editors' Choice for password management! Rubenking evaluated both our free and Premium products, citing our portability and comprehensive security amongst our greatest features. When comparing free and Premium, Rubenking comments, "You don't have to pay a penny to get extremely comprehensive and flexible password management from LastPass. The free edition does just about everything you could ask. By spending a dollar a month for the Premium edition, you extend the product's security and scope. Specifically, you gain multi-factor authentication, additional platforms, and useful ancillary programs. Choose either one; both merit recognition as PCMag's Editors' Choice." We're proud of the five stars we received for both versions of LastPass! We hope to continue providing quality products for our one million users and counting.